My husband and I have gone camping for the past several years and we borrow camping gear from his family who has been camping since my husband was a boy scout. We take a trailer full of gear when we go camping. Our friends who join us are always impressed and happy to discover we camp in comfort and eat very well. No hot dogs on sticks when we go camping. You can camp in style, too, if you start gathering the right gear. I’ve compiled a list of the essentials. We take a lot more than what I’ve listed, but you don’t need a trailer full of stuff to have a successful camping experience. But it helps. So, here it is: the Ultimate Camping Supply List! The most impressive part of our campsite setup is the kitchen. Most campsites we visit in Texas have electrical and water hook ups. Also, there is usually a covered picnic table. If there isn’t a cover over the table, put up a canopy. Not only will your table top be dry if it rains, but it’ll be protected from dropping leaves and heat from the sun. We set up our camp stove at one end of the picnic table, where ever we’ll have the most room to move about. If you do’t have a stand for the camp stove you can place it on the table itself. We keep the ice chest and storage bins close by, too. For lighting, we have used a propane lantern, but prefer to use a rope light. You can plug it in using an extension cord and hang it around the awning over the picnic table. Not only does it provide a lot of light, its festive! Tip for cold weather camping: pack a coffee carafe and coffee tumblers to keep your beverages warm or from freezing over night. Our last camping trip was during a cold front, bringing temperatures in the teens to our campsite. There was a short window between our coffee being too hot to drink and too cold to enjoy when we used regular mugs. We also made mulled wine and kept it hot in the carafe (plus it made it easier to pour). See the end of the post for some of my favorite brands! Another tip: Use silica packets in your storage bins to help keep unwanted moisture out. Save up those silica packets you find when you purchase new things, like shoes. Or purchase some using the link at the end of this post. I didn’t add any grocery list items because it always depends on what you decide to cook. There are staples, however, that you will almost always purchase. Once we organize the kitchen, we look for an even area of ground where we can setup our tent. Make sure to move any large rocks from the area, too. 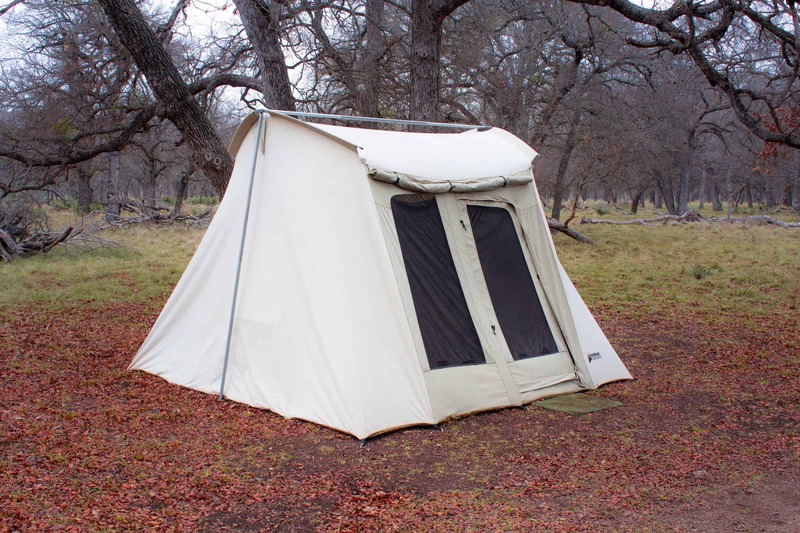 If your tent doesn’t come with a ground tarp, you’ll want to purchase one separately. The tarp will help keep the tent clean and dry, and in the winter time, warmer. Pick the direction you want your tent door facing, and set up your home-away-from-home. Place an old outdoor rug outside the tent door to help keep mud out. We also place a rug inside by the door for our shoes so we don’t track mud where we sleep. It also saves time when you clean out your tent – less dirt coming in means less dirt you have to remove. Whether we are camping during spring or winter (we rarely attempt summer camping in South Texas), we use padding under our sleeping bags. If its really hot, and your tent is large enough, consider using cots. In the winter, you want to sleep on the ground because you’ll be warmer. We don’t use air mattresses when we camp because it takes up to much room inside the tent. We’ve found that self-inflating sleeping pads work just fine. To find out which kind of padding is best for you, check out this article from REI. If you’re camping in the winter, you want lots of warm blankets and extra sleeping bags for padding and warmth. Wool blankets are best. It’s also a good idea to place your bags/backpacks behind your pillow to help keep the cold draft away from your head at night. It’s also a good idea to hand up tent lights and unpack your things for the night when you first setup the tent. That way you won’t be doing in the dark by flashlight. If you have two canopies or don’t use one for the “kitchen”, it’s nice to have a canopy over the fire pit in case rain is in the forecast. If its really windy, you can attach a tarp to the poles to help block the wind. It’ll make building a fire a lot easier. When building a fire, use wood chips as kindling to help burn your smaller pieces of wood faster. We’ve purchased a huge bag of hamster cage bedding. We’ve also always used a lighter rather than matches to light the fire, but its good practice to have matches on hand in case your lighter runs out of fuel. Make sure you stash the extra wood somewhere dry if rain is in the forecast! Place chairs around the fire, keeping the chair covers hung over the backs so you don’t lose them. If you plan on showering and need a place to hang your wet towels, tie up rope away from the fire so your towels don’t smell of smoke. Keep your headlamps somewhere you can find them after sunset. Its a lot easier to cook, mend a fire, or search in your tent using a headlamp than a flashlight. To make clean up easier, set up a dish washing station. Start boiling water as soon as dinner is done, either using coals from the fire over the camp stove. As soon as you’re done eating, the water should be ready. Have one bin for soapy water and one bin for rinsing clean. When cleaning a dutch oven, only use hot water (and very little soap is necessary). Use a plastic scouring brush only. Dry the dutch oven completely and treat it using Crisco or another form of vegetable oil. If you have fur babies, bring them camping with you! My third time camping we went with another couple and their dog. He was a very well trained Brittany Spaniel who enjoyed curling up in the chair with his owner. By the next year’s camping trip we had a dog of our own. He’s an English Sheppard (pictured above). He enjoyed sleeping as far away from the campfire as possible. Since every dog has its own personality, what you need to bring to make your pup comfortable, entertained, warm, etc., will vary. But I’ve listed the basics and necessities down below. Remember: just like other food, you’ll need to secure the dog food so that other animals cannot get into it at night. I prefer to use a harness for my dogs rather than a collar, especially when camping. I think they’re more comfortable and provide more control over your dog’s movements. Not only will your dog not accidentally joke himself, but they won’t be able escape as easily (main reason I don’t rely on my dog’s collar…the Houdini). Plus, its easier to grab than a collar if you find yourself in one of those situations. At the end of this post are a list of my Favorite Things to bring on camping trips. You’ll find options for your dog, too! I highly suggest the 6 Way Leash, whether you’re walking your dog, going to a restaurant, or camping. I love mine! Download a PDF version of the full Camping Supply List. The following list contains outdated Amazon Affiliate Links. I am no longer an Amazon Affiliate member so the links attached to the images below may no longer work. But I still recommend these products so I’m leaving the images for my readers’ reference. The skillet is designed for camping with its collapsible handle! The Coffee Peculator can be used on a camp stove or coals. Keep one of these in your sleeping bag to keep your toes warm at night! Always a must when camping. These expand and come in several colors so everyone can pick their favorite. The two hooks on either end of this leash allows you to change the length of the leash. You can also hook two dogs together and use a second leash to walk them simultaneously. My favorite part about this leash is being able to hook your dog to anything! You can create a large loop to wrap around your waist or over your shoulder. Or you can hook the leash around a table leg at a restaurant or campsite! This leash is a life saver! I purchased this tumbler on a whim and am so glad I did, even though its a little expensive. It keeps hot drinks hot for hours! And ice cubes stay frozen for a long time, too. It was great for winter camping because my coffee stayed warm in the morning and my water didn’t freeze at night. It’s great to use when not camping, too. What supplies do you bring camping? Share in the comments!